— Are you linked like a baboon, or like a lawyer? Anthropological, ethological, neurological and social media research suggests that if you are attempting to network with anyone who has more than 150 contacts, it may be impossible for you to ever have a “stable social relationship” with that person, depending upon factors such as when you joined and your relative importance to that individual—and, crucially, on how “stable relationships” is defined. Conversely, the argument goes, if you have more than 150 people in your network, it is virtually certain that no more than 150 of them will have a stable relationship with you—again, depending on the definition (although rival and more recent estimates, as well as Dunbar’s calculations of statistical error. put the number as high as 230). This means that professionally, as well as socially, you are going to have to carefully consider what it is that you expect your professional and social networks to accomplish, and whether joining a network or circle is going to be worthwhile, in terms of meeting your expectations or providing perhaps unexpected rewards. If you are looking forward to enjoying increasing benefits from increasing network size, you may have to redefine what “benefits” means and how you will gain them once your or another network exceeds 150 (or 230) people. That’s because, according to UK anthropologist Robin Dunbar, 150 appears to be the average limit of “stable relationships”—a limit inferred from averages—that the average human brain can maintain, where “stable relationships” are defined as “relationships in which an individual knows who each other person is, and how each person relates to every other person”. (Source: http://en.wikipedia.org/wiki/Dunbar%27s_number). It is unclear from this whether one specific individual knows each other person, or whether each individual knows each other person. That’s a huge difference. If what is meant is that one specific individual knows everybody else, the condition is not as stringent as the definition that specifies that “stable relationships” are relationships in which each individual in the group knows who each other person is and how each person relates to every other person. The “one individual” definition fits the relationships between a lawyer and his otherwise mutually anonymous clients; the “each individual” definition more accurately describes the set of mutually transparent relationships in a compact and intimate baboon troop. This difference is reflected to some degree in the sociological difference between a cohesive “group” such as the baboon troop and an “aggregate” of completely independent, yet co-present individuals, like Walmart shoppers pushing carts down cavernous aisles on a slow day or one lawyer’s set of clients, co-present only in his mind and paycheck. Even though sustaining the baboon network of relationships requires more effort by the baboon troop than what I will call the law firm’s “fork” of relationships (with each lawyer as a handle, his clients as the independent prongs, a.k.a. “tines”), lawyers and their law firms presumably divert the conserved energy into services that justify their fees—if that is imaginable. A baboon social network of mutually and fully aware members is a very different concept from the commonsense idea that your relationships are stable if you, but not necessarily any of the others in your network, knows and interacts with each member in your social “fork” or a more complex “tree”, which, at least from a self-centered perspective, features you as the root and everyone else as branches and their twigs—which will therefore not be a pure network or even a circle. The logical inference is that, if there is a clear “pecking order” in your networked pack or if its survival requires collaboration of each member, as is the case with baboon troops, it has to be more like a baboon network of relationships than a lawyer’s fork or LinkedIn tree, circle, fork, etc. Otherwise, for professional purposes the much more common and weaker, more casual and semi-anonymous links recruiters seem to favor can suffice, but with the caveat that they should be recognized to be just that—weak. In any event, you should be aware of whether you are creating a social network, a social circle, a social tree or a “social fork” with only prongs (“branches” that lead to no twigs or nets). For example, the visual imagery of the increasingly quaint term “social circle” actually suggests and perhaps best reflects one kind of social reality in which you may be very “close” to those who are the shortest social (or professional) distance from you (your closest acquaintances, who lie along the “circumference” of your “circle”), but very socially (or professionally) distant from the member “diametrically” opposite you, even though that person is a member of, i.e., a “point” on your circle. So, do you want to create social circles—or true baboon-style networks, Amway-style trees or lawyer forks? Popularly known as “Dunbar’s number”, the 150 figure (actually rounded off from 147.8) has been confirmed through and derived from studies of primate groups and brains, including those of humans—packs, troops, bands, clans, cultural lineage groups and tribes, and, most recently, observed in Robin Dunbar’s 2010 study of Facebook circles. On the basis of his research, in 2007 a Swedish tax authority study mandated a maximum of 150 personnel per office. Dunbar first investigated and proposed an upper limit to stable social relationships in the 1990s, through research into primate social behavior and brain/social group size correlations. His studies led him to attribute the 150 upper limit to performance limitations of the human brain’s neocortex, the most recently evolved portion of our brains. This is a line of inference not unlike positing that the ideal Greek polis or city-state described in Plato’s dialogue Laws should have no more than 5040 (male) citizens, because, it might be argued, an assembly larger than that would not be able to hear any speaker at assemblies (in effect, a limitation of the capabilities of the auditory lobe of the neocortex, although, in fact, Plato proposed that number for mystical-mathematical reasons). Real, rather than ideal, cohesive groups historically seem to have had Dunbar’s number of members: For example, by my calculation, given that a U.S. army company ranges in size from 85 to 225 soldiers, the average is 152 with an upper limit of 225, both numbers almost exactly matching Dunbar’s reported estimates of splitting points for Hutterite settlements, Neolithic farming village size and the upper limit his data suggested. That there has to be some limit to how many contacts can be intelligibly or profitably cultivated seems intuitively obvious. Less obvious is the size and the map of the links. In particular, given that you can be mapped into and included in the set of your relationships in multifarious ways, e.g., one (namely, you)-to-all, one-to-many, many-to-many, many-to-all, each-to-all, each-to-many and endless combinations thereof, it is likely that not only do you not fully understand the nature of your relationships, but that also you misunderstand and therefore perhaps mismanage them. You may, for example, imagine that all your “friends” on Facebook or contacts on LinkedIn are also friends with or contacts for each other, i.e., that you are part of a supersized baboon troop, when, in fact, you are more like the lead lawyer presiding over mostly mutually unaware, uninterested and non-interacting clients. Worse, you may merely be one of those clients, from the perspective of some or all of the other members. Irrespective of the format and mapping, the basic laws of economics as well as neurology suggest there has to be a limit: The economic law of diminishing returns exempts nothing and eventually limits the value of added labor or other capital inputs to a fixed, limited resource. In this instance, the added capital is other people, added to your network; the limited resource is your brain. Ditto for other people’s social and preofessional networks, circles, trees and forks. The statistical range Dunbar proposed, based on the confidence interval of the data is 100 to 230 people—a number perhaps also, as some research suggests, dependent upon the intelligence of the individual brain under consideration. A February 2011 Wall Street Journal article, titled “How Many Friends Can Your Brain Hold”, cites Dunbar’s research correlating the number of stable relationships with the size of the orbitomedial prefrontal cortex: On average, and presumably no matter what form the social linkages take, the more people there are in an individual’s social group, the more gray matter in that part of a person’s brain (although you need not panic if your circle is almost as small as a point, viz., only you, since it is unclear whether the converse is also true, i.e., the fewer the links, the smaller the mass of gray matter, and whether this correlates in any way with IQ—especially given the durable and to some extent warranted stereotype of the antisocial genius nerd locked up in his lab after dating someone once, a long time ago, on a blind date, which didn’t work out. Besides, the orbitomedial prefrontal cortex is only about one small physical part of the brain, not its whole performance). “The interesting thing is that you can have 1,500 friends, but when you actually look at traffic on sites, you see people maintain the same inner circle of around 150 people that we observe in the real world,” Dunbar told The Sunday Times. http://www.telegraph.co.uk/technology/news/7066454/Facebook-friends-are-virtual-finds-Oxford-University-study.html. What is unclear is whether that Facebook “network” or “inner circle” (or should it be “inner doughnut”?) is, on average, structurally more like a baboon troop or a law firm. In any event, and irrespective of what the carrying capacity of your own brain is, you need to decide which kinds of links you want to cultivate—strong or weak, fork or more?—and how to interpret the ones you already have: a true network of mutually aware members (baboon), circle (like an NFL half-time cheerleader show), tree (Amway distribution network) or fork (lawyer and clients)? Ironically, the de facto ideal of pure networking, the linkage framework that seems the most sophisticated, complex and complete, is that of the seemingly least intelligent—the networked baboon. Unsurprisingly, and in keeping with the tradition of lawyer jokes, the least complex and complete is that of the ostensibly most intelligent group—the lawyer, and his fork clients. 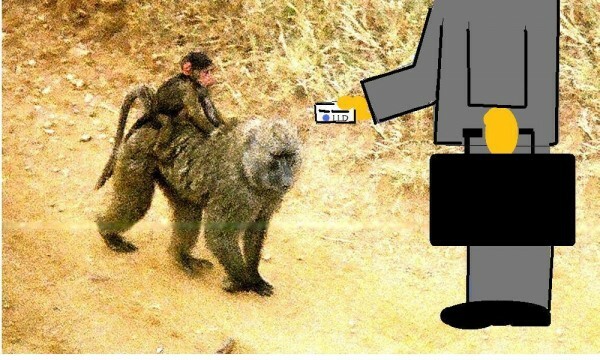 …Unless, of course, the average baboon is, unlike the average client, too smart to hire a lawyer.